Rhine Landscaping is a full service design/build company who strongly believes in the importance of proper design. We also know that no two clients and/or projects are alike in scope. That is why we offer a flexible design approach which ensures a match of design services to the needs of each individual. Our design services begin with our first Initial Client Consultation. This is where we introduce Rhine Landscaping and find out about the type of project you are envisioning. After listening intently, we will ask you some questions and explain how we can best be of service. 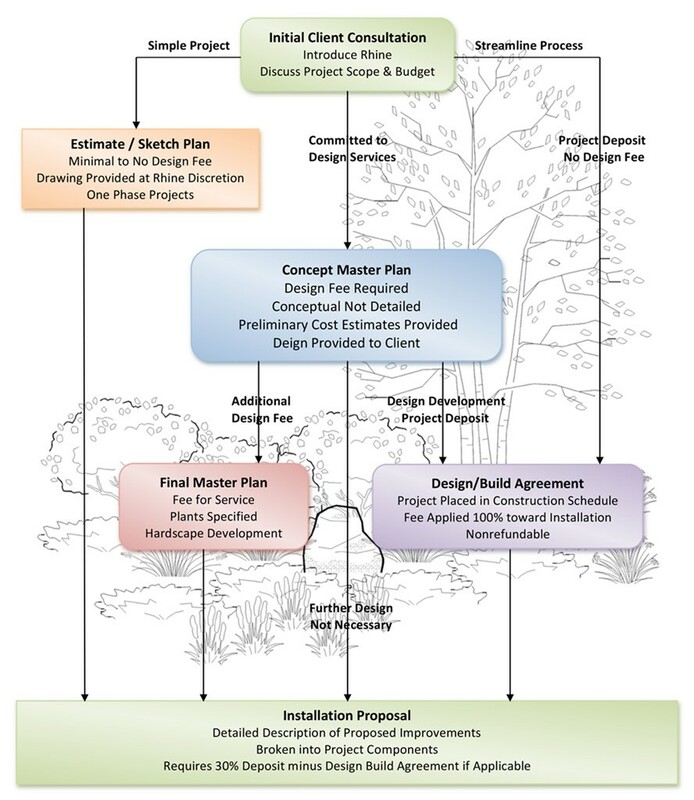 If you have a rather simple project that does not require significant design time, we often can provide a design and installation proposal with no design fee, this is referred to as our Estimate/Sketch Plan. If you interested in having a design prepared by one of our in-house Landscape Architects, we can offer our Concept Master Plan services. This service has a design fee associated with it but is an excellent way to get a conceptual design as a first step in realizing your outdoor vision. For the individuals who are more comfortable with their project scope and budget from the on-set, we offer a streamline process that can get your project constructed sooner and actually avoid design fees. Our Design Build Agreement is essentially a good faith commitment to begin our design/build process. In return for your commitment to work with Rhine Landscaping, we place your project in our construction schedule and complete your design free of charge. We hope that when you are ready to begin work on that project that you have been dreaming about that you will call Rhine Landscaping. We look forward to working with you.